Protect Your Portfolio... With Bitcoin? 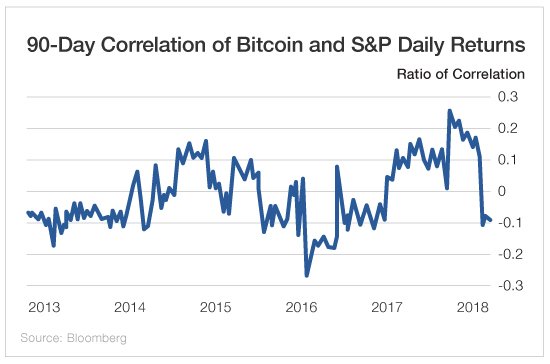 The study attempted to model and forecast the volatility of bitcoin returns and analyze its correlation to other markets. Using statistics and machine learning, the study found, "The correlation analysis of bitcoin returns and the financial indices, particularly DJIA for the U.S. market and ASX for the Australian market and the exchange rate of AUD/USD, has shown the bitcoin price movement does not follow any of these instruments." In layman's terms, the price of bitcoin is not correlated to stock market moves or the value of other currencies. This may not sound like headline-worthy news, but it could completely change how you look at cryptocurrencies - and how you invest. After all, a lack of correlation can be a valuable characteristic for any investment. For decades, analysts, hedge fund managers and personal financial advisors have suggested putting a portion of your portfolio in gold. It's generally considered a safe investment. Amid the chaos [of the Great Recession], gold not only outperformed most of these alternative investments but also was one of the few assets, along with government-issued securities, to deliver a positive return on the order of 4% in 2008. Gold retains its value regardless of what the market does. So when the market turned south, those holding gold did not take the losses that those holding commodities or real estate did. And that brings us back to bitcoin... It too could soften the blow of a correction. A perfect correlation is a 1-1 ratio, whereas perfect negative correlation is -1 to 1. The closer you are to zero, the less correlation there is. As you can see, bitcoin's 90-day correlation to the S&P's daily returns averages between just -0.1 and 0.1. Not being correlated to the market makes bitcoin an ideal reserve currency to hedge against inflation or market crashes. When institutions, advisors and investors start adjusting their portfolios to reflect this discovery, look for crypto to boom like nothing we've ever seen before!